band, the crista terminalis, inserting in the fashion of the teeth of a comb (Figure 1.1). The left atrial appendage, in contrast, is narrow and pointed, often looking like a crooked finger. 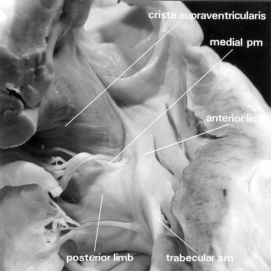 The musculi pectinati are confined within the appendage, so that the left atrial vestibule is smooth (Figure 1.1). The presence of a morphologically left appendage on one side, and a morphologically right appendage on the other, constitutes lateralization. This can be seen in the situs solitus, or situs inversus. In other situations, however, there can be isomeric situs with duplication of morphologically right or morphologically left structures on each side of the body. Because the spleen is the only organ in the body that is left-sided from its inception, right isomerism tends to be associated with asplenia, while left isomerism is usually accompanied by polysplenia, in which the spleens arise on either side of the dorsal mesogastrium (Van Mierop etal., 1972). In right isomerism, both lungs tend to have three lobes, and to be fed by eparterial bronchi, whereas in left isomerism, both lungs tend to be bilobed, and to have hyparterial bronchi. The remainder of the organs is haphazardly distributed; an arrangement often termed visceral heterotaxy, albeit that, taken literally, ''heterotaxy'' describes any departure from the normal (Macartney etal., 1978). It is the appendages, nonetheless, that provide the best guide to isomerism within the heart. Thus, when musculi pectinati encircle both atrio-ventricular junctions, there is right isomerism, whereas bilaterally smooth vestibules are indicative of left isomerism (Uemura et al, 1995b). The method of distinction between lateralized and isomeric situs should not depend on autopsy. The traditional division of complex malformation with jumbled-up bodily organs into the subsets of ''polysplenia'' or ''asplenia'' is unsatisfactory for a number of reasons. First, there is no real consensus on the distinction between polysplenia and one large spleen plus multiple small spleens (Moller etal., 1967; Landing etal, 1971; Van Mierop etal., 1972). Second, the so-called ''asplenia syndrome'' has been described in the presence of a spleen, albeit rudimentary (Layman etal., 1967). Most importantly, there are marked discrepancies in classification when features are analysed in the post mortem room on the basis of splenic morphology, as opposed to the morphology of the atrial appendages (Uemura etal, 1995a). If such uncertainties exist at autopsy, they are hardly likely to be clarified by investigation in a living patient. In the living patient, it is simplest to infer the atrial situs having visualized the situs of the tracheobronchial tree by plain chest radiography or bronchial tomography (Van Mierop et al., 1970; Partridge etal., 1975; Macartney etal., 1978). A ratio between the lengths of the two main bronchi that is less than 1.6 indicates isomerism, whereas a ratio higher than 1.6 indicates lateralization, with the morphologically left bronchus being longer. Although discordance between bronchial and atrial situs is also recognized (Caruso and Becker, 1979), the rule of broncho-atrial concordance is accepted as one of the most reliable to be found in paediatric cardiology, given that all rules have exceptions (Macartney et al, 1980). Routine cross-sectional echocardiographic scanning of the descending aorta and inferior caval vein also permits accurate inference of atrial arrangement, with the usual situation found when they lie apart with the aorta to the left, mirror imagery when they lie apart but with the aorta to the right, and right isomerism when they run together (Huhta etal., 1982). Interruption of the inferior vena cava is suggestive, but not diagnostic, of left isomerism. Because of the lack of complete harmony between the situs of the atrial appendages and the rest of the organs (Uemura et al., 1995a), the term ''viscero-atrial situs'' has limited meaning. It is the arrangement of the appendages that is the key to the appropriate description of the atrial segment (Uemura et al., 1995b). When in doubt, all systems should be described in independent fashion. • The inlet component, upstream to the origin of the tensor apparatus. • The outlet component, or the outflows to the two great arteries. 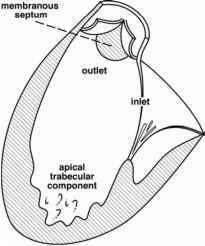 • The apical trabecular component, found toward the apex of the ventricles. septum. The mitral valve can also straddle in this fashion, and straddling is usually associated with overriding of the valvar orifice. On occasion, straddling occurs without overriding, or overriding without straddling (Milo et al, 1979). Pathological observations indicate a continuous spectrum of the degree of straddling, from the situation in which one cord merely crosses the septum, to one in which tensor apparatus originates equally from either side. There is a similar spectrum of overriding. In order to determine the atrio-ventricular junctional connections, the valve must be arbitrarily assigned to one ventricle or the other, just as will be done for overriding arterial valves. The valve is assigned to the ventricle that supports the majority of the circumference of the atrio-ventricular junction. Irrespective of these junctional arrangements, however, the presence of valvar overriding has no influence of the apical trabeculations within the ventricles, albeit that the chambers tend to be hypoplastic when they receive only part of an inlet or outlet. In the past, these situations demanded that we change the name of ventricles and rudimentary chambers according to whether or not they possessed an inlet component. Now, we recognize that all chambers within the ventricular mass possessing apical components can be named as ventricles (Anderson and Cook, 2004). They can be of right, left, or indeterminate morphology. 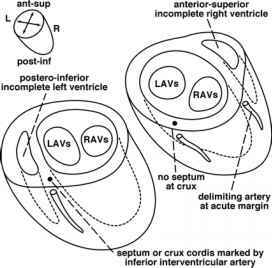 Right and left ventricles coexist, with the apical parts separated by the apical septum. This septum carries the conduction system, and is perfused by the septal perforating arteries. 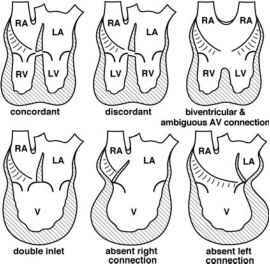 Ventricles of indeterminate morphology lack an apical septum, and are the only examples of anatomically single or solitary ventricles. The apical septum is further characterized by having a morphologically right side that is heavily trabeculated, and a morphologically left side that is finely trabeculated and usually completely smooth in its superior portion. The other important right ventricular characteristic is the presence of a well-developed infundibulum, which interposes between the leaflets of the atrio-ventricular and arterial valves, these leaflets being typically in fibrous continuity in the roof of the left ventricle. This rule, however, has some well-known exceptions. When the atrio-ventricular valves are normally incorporated into the ventricles, a mitral valve, with a solitary zone of apposition between two leaflets, and two papillary muscles not attached to the septum, reliably identifies the left ventricle. A tricuspid valve, with three leaflets, three zones of apposition, and a septal leaflet attached by short cords and multiple discrete papillary muscles to the septum, indicates the right ventricle. 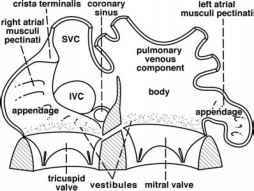 In the normal heart, the ''supraventricular crest'' (crista supraventricularis), separates the attachments of the leaflets of the tricuspid and pulmonary valves (Figure 1.2). At the point where this crest fuses with the rest of the septum, a small part of muscle can be identified by dissection that interposes between the subaortic and subpulmonary outflow tracts. Without dissection, however, it is not possible to distinguish between these two components. In hearts with anomalies involving the outflow tracts, the two component parts are able to achieve their own identity. Instead of one muscular structure in the ventricular roof, there are two. One, the ventriculo-infundibular fold, separates the attachments of the leaflets of one or both atrioventricular valves from the leaflets of one or both arterial valves. The other, the muscular outlet, or infundibular, septum separates the subarterial ventricular outflows to the two great arteries. It is confusing, therefore, to use the term ''crista supraventricularis'' in an attempt to describe these muscle bundles when the outflow tracts are themselves malformed (Anderson et al., 1977). The terms ''parietal band'' and ''septal band'', still popular in certain parts of North America, are even more confusing. This is because most surgeons use ''septal band'' in malformed hearts to describe the septal attachment of the muscular outlet septum. In the normal heart, however, the term is also used to denote an entirely different structure. This is the prominent Y-shaped muscular strap that reinforces the right ventricular septal surface. This strap is best described as the trabecula septomarginalis (Vricella et al., 2004). It has two limbs, the postero-inferior, which supports the medial papillary muscle complex or the papillary muscle of the conus, and the anterosuperior limb, which runs in cephalad direction to support the leaflets of the pulmonary valve. In tetralogy of Fallot, for example, these limbs form a Y-shaped configuration and constitute the inferior rim of the ventricular septal defect. 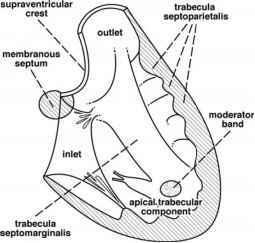 The stem of the Y is the body, which gives off a series of trabeculae septomarginales, one of which, the moderator band, extends to join the anterior papillary muscle of the tricuspid valve (Figure 1.2). These considerations are particularly pertinent to tetralogy of Fallot. Thus, in this setting, it is the septal and parietal extensions of the muscular outlet septum that are mobilized to relieve infundibular obstruction, not the ''septal'' and ''parietal'' bands. And the defect is certainly not ''infracristal'', since the components of the normal supraventricular crest have sprung apart as a result of the malalignment between the muscular outlet septum and the rest of the ventricular septum. Because of this septal malalignment, the aortic valve overrides the septal defect, with biventricular connection of the aortic valve (Becker etal, 1975). There is in general little difficulty in distinguishing the two great arteries, in as much as the aorta gives the origin to the coronary and brachiocephalic arteries, while the pulmonary trunk divides into right and left pulmonary arteries. On occasion, one coronary artery or, more rarely, both coronary arteries, can originate from the pulmonary trunk. A brachiocephalic artery may appear to arise from the left or right pulmonary arteries, but in such cases, careful analysis will show that the communication is via a persistently patent ductus arteriosus. No case has thus far been described, to the best of our knowledge, in which there was real difficulty in distinguishing the two great arteries.